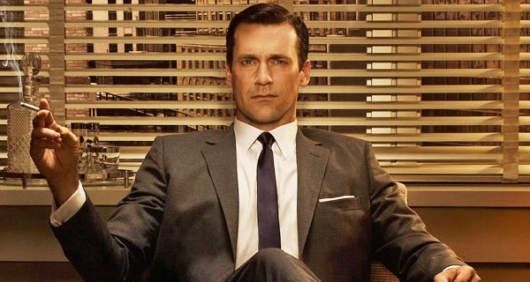 Last week’s Mad Men gave us perhaps the biggest shock to the audience that we’ve ever experienced on the show. Even so, it was given as more of a sigh than a shock. Betty Draper (January Jones) has lung cancer and six months to live. She is ever practical, wanting to make sure Sally (Kiernan Shipka) does not have to go through what she had to with her mother. It was a terribly sad episode. Don (Jon Hamm) is on a road trip, but runs into trouble with some vets, and gets beat up pretty bad. Even when he runs to try to find himself, or any kind of answer, he ends up losing himself anyway. Mad Men 7.14 “Person To Person” review: Excellent, excellent, excellent episode. With a little bit of buildup, it does take us from person to person to person, etc. This is the episode of endings. How does it end for Betty and Sally and the kids? Sally told Don about Betty. He called Betty and they both cried. She asks him to respect her wishes, and let the kids have a family and live with her brother. Sally shows Bobby how to cook, taking on the maternal role. She is no longer Sally the brat. The last glimpse of Sally and Betty is bittersweet. How does it end for Roger (John Slattery)? He seems at peace and thoughtful. He sets up Kevin with a rich future, and tells Joan he is marrying Marie (Julia Ormond). How does it end for Pete (Vincent Kartheiser)? He shares a sweet goodbye with Peggy (Elizabeth Moss), then flies off happily into the sunset, back together with his family. How does it end for Joan (Christina Hendricks)? Mad Men unknowingly (or maybe knowingly) presented an ad for trying cocaine. I have never seen two people more happy than Joan and Richard trying coke. To Joan, the drug makes her feel like she got some “good news.” Joan offers Peggy a chance to be partners – a company run by women. And while Richard did make her happy, nothing makes Joan more happy than running her own career. She loses her man, but gains her dream. How does it end for Peggy? “People just come and go and no one says goodbye.” Don calls Peggy and summarizes his life in the shortest and most negative way possible. Peggy is worried. Stan (Jay R. Ferguson) tells her she can care about Don, but still let him go, after Don calls her sounding suicidal. I thought this was it – the ending we were all sure of. After Joan’s offer, she debates with Stan, who gets angry with her. Then Stan confesses his love to Peggy over the phone. I knew it! And then she confesses her love in her Peggy way (talking herself through it). It might be the sweetest declaration of love ever, in the history of television ever. I’m serious. How does it end for Don Draper? How does it end for Mad Men? With the “I’d Like To Teach The World To Sing” Coke comercial of the 1970s, that I used to see and sing throughout my childhood. It was one of the biggest ads of that time, and appropriate to end with an ad, and with such a message of hope, as all our characters left us happy, and in Betty’s case – accepting. As much as us horror-supernatural-drama jaded cynics love twists and surprises in our tv, the child in all of us loves the happily ever after. Goodbye, Mad Men. Thank you for a quality show and a satisfying end. Don’t forget to tune in to the series finale of AMC’s iconic series, Sun., May 17th at 10/9c.